For the last few weeks Makeup Revolution have been throwing new releases at us, not literally, but they've been pretty much taking over my Facebook news feed and I've been sat at the laptop impressed with everything I've seen. I was fortunate to be sent a package of some of the items, including: The Iconic Dreams palette if you want a read. I were also sent 2 of The ONE Fluid Blushers. Desire is my favourite of the two. It's quite scary looking in the bottle, but once applied it really is beautiful. I put this on my hand before applying to my face and it almost looks red but once applied you're left with a beautiful pink shade. Desire also has a really lovely shimmer to it, that just adds to the finishing glow you achieve once applied. I can't stress enough that you just need the smallest drop of this, though, it is buildable if you want to achieve an even more intense shade. I also wore this on my lips, and it works so well. Pink Dew looks beautiful in the bottle, like it would be my sort of shade, but it wasn't. 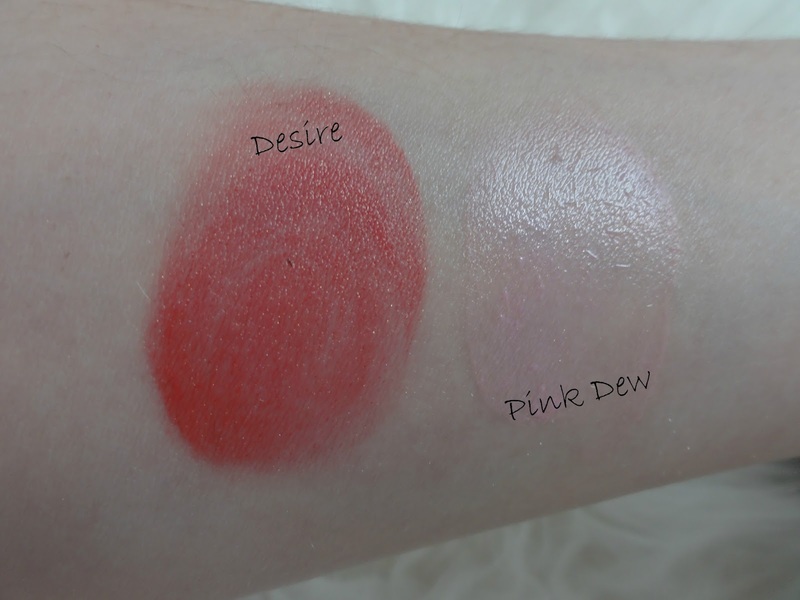 Pink dew isn't very pigmented, and just doesn't work well with my pale skin tone. I tried to build it but the shade just sunk into my skin, like they were nothing there at all. I think it may work better for those with a tan and be a lot more visible (swatches on MUR website). The product is quite thin and watery but applies well and is easy to blend, as well as being buildable in terms of creating a more intense colour. For £3.00 each they are such a bargain and worth picking up. However, I don't recommend Pink Dew for those with fair skin.